정지영, 김종남,(2011).중학생의 우울과 지각된 부모양육태도, 인지적 정서조절전략, 행동억제 기질 간의 관계.청소년학연구,18(12),227-254. 본 연구에서는 중학생 집단을 대상으로 지각된 부모양육태도, 인지적 정서조절전략, 행동억제 기질이 우울에 미치는 영향이 성별에 따라 각각 어떤 차이가 있는지 탐색하고자 하였다. 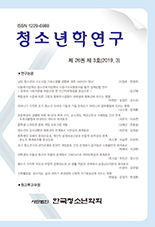 연구참여자는 경도 이상의 우울한 중학생 184명이었으며, 우울척도(CES-D), 지각된 부모양육태도(PBI), 인지적 정서조절전략척도(CERQ), 자기보고식 회고적 행동억제(RSRI)척도를 실시하였다. 그 결과 첫째, 지각된 부모양육 태도 중 아버지의 과잉기대와 방치, 어머니의 방치가 남학생 우울과 정적 상관을 보인 반면, 여학생에서는 아버지의 과잉간섭과 어머니의 과잉간섭이 우울과 정적상관을 나타냈다. 둘째, 행동억제기질 중 분리불안은 남학생의 우울과, 수줍음과 신체화는 여학생의 우울과 정적상관을 나타냈다. 셋째, 세 변인의 하위요인들이 남, 여학생의 우울에 미치는 상대적인 영향력을 검증한 결과, 남학생 집단에서는 어머니의 낮은 감독과 파국화 전략이, 여학생 집단에서는 파국화 전략이 가장 큰 영향을 미치는 것으로 나타났다. 인지적 정서조절 전략 중에서는 반추와 파국화가 남, 여학생의 우울과 정적 상관을 보여 성별에 따른 차이를 보이지 않았다. The present study focused on relationships between perceived parental behavior, cognitive emotion regulation strategies, behavioral inhibition and depression in early adolescents. The samples were 184 early adolescents. They completed a measure of depression scale(CES-D), perceived parental behavior, cognitive emotion regulation strategies, and behavioral inhibition. The results showed differences in perceived parental behavior among boys and girls. Among the cognitive emotion regulation strategies, rumination and catastrophizing were correlated with both boys and girls. Boys were correlated with separation anxiety, whereas girls were correlated with shyness and somatization among the factors of behavioral inhibition. Furthermore, the adolescents differed in relative strength of the relationships: mothers` low monitoring and catastrophizing played the most important role in the boys` depression, whereas only catastrophizing was shown as the strongest factor in girls` depression.